A Fast Education: Should ‘Car-Culture’ Be Taught In Schools? The modern world has become dominated by the transport culture, most specifically the culture of ‘the car’. Our society rests on a solid foundation of communication, trade and distribution. The global transport system therefore is one of the most fundamental aspects that ties together every ‘sector’ of our world, whether this be business or personal. Of all methods of transportation, arguably the most comprehensive is the road network which accommodates everything from our cars, buses, vans, coaches and lorries to name a few. In our daily lives, most of us will interact with either the road network or the vehicles that use it. Cars especially are becoming increasingly vital for success in our lifetime. However, the auto-verse does not feature in the education of many young people, how can this be right? With so many applications, should ‘car culture’ not be an indispensible part of the education system? For any regular readers of my posts, I am not often one to use scientific reasoning and hard data to illustrate my arguments, but this is an issue that I do feel passionate about. Firstly, I would like to draw your attention to the image you see above; you may be wondering why the world is covered in various shades of yellow. The dark yellow that covers most of the map is a representation of the extent of the global road network, based on the research conducted at Columbia University. To therefore argue that cars, transport systems and road safety is not relevant to the education of young people is somewhat silly. The definition of ‘school’ is an institution for educating children; it gives them the key skills they need to go out into the world and forge their own paths, both in terms of career and personal development. If schools are in fact there to teach the young generation about the ways of the world, it would be almost misguided to leave out essential skills like road safety and traffic education from the national curriculum. It is not just me that shares such an opinion; the Institute of Advance Motorists (UK) believes that road safety should become a mandatory part of the curriculum, so as to reduce the number of incidents on the road involving young people. If they are aware of how traffic systems operate, it will reduce the risk to themselves and drivers on the road. Furthermore, a recent survey has shown that only 8/15 European countries have mandatory traffic education courses as opposed to voluntary ones. 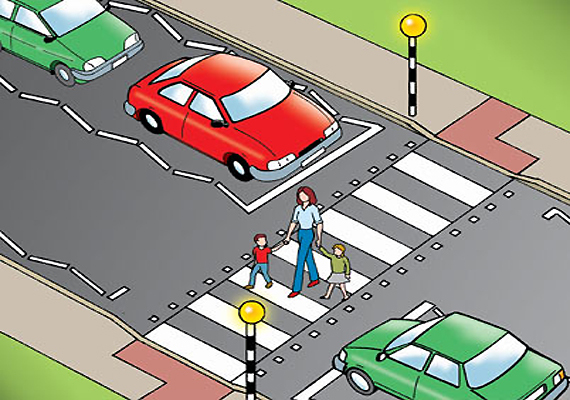 As a child, I do remember various adverts on television about how to safely cross the road (STOP, LOOK, LISTEN and all that) and while being taught how to ride a bike on the main road basic traffic information was given. However, a few adverts and a voluntary riding course may be a good start, but I do not think it is enough. In the future, I would like to see a more comprehensive exploration of how young people interact with the world around them (most specifically roads, considering for many of us the ‘world around us’ is jam packed full of roads with vehicles on them). I have to say that I agree with this; learning the rules of the road is important, but I do not think that it goes far enough. In a similar way that we are often taught about how to write a successful CV and how best to act in an interview, I believe that driving falls under the same category. Driving encompasses both the personal and the professional side of someones life, while also providing prominent risks. Across the UK, more and more ‘young drive’ experiences are cropping up all over the place; my first ever driving lesson took place on the ‘Young Drive Experience’ at Brands Hatch race track of all places. As a 12 year old, it was the most exciting thing I had ever done. What made it so good was that it was in essentially a simulated environment with minimized risk, but it was the same sensation as any driving experience. I remember back to my early school years when we would be taken to the local swimming pool to learn how to swim. I was always told that everyone should at least know how to swim and then choose not to do it. If driving isn’t ‘relevant’ to be taught in schools, may I ask one question; how many times do you find yourself having to swim to work? If swimming is taught so the skills are obtained, then it should be the same with driving. After all, people drive a hell of lot of more than they swim. While naturally I have nothing but respect to opinions such as these, the examples that were provided as things that were ‘far better’ to teach could also be classified under the same banner as driving. Surely not everyone needs to be able to cook, there are other options. Online banking and accountants are making handling our finances easier and not personally necessary. The same could also be said about first aid; it is not (hopefully) a constant need and there are those (paramedics) that are already trained in such things. Where I am not trying to belittle any of these elements; they are all in there own way vital to a healthy and successful lifestyle and I do believe they should be taught. But technically speaking the same argument can be applied to those as driving. Therefore, either none of these should really be taught in schools or (and this is the more likely) they all deserve their rightful place in the education system. 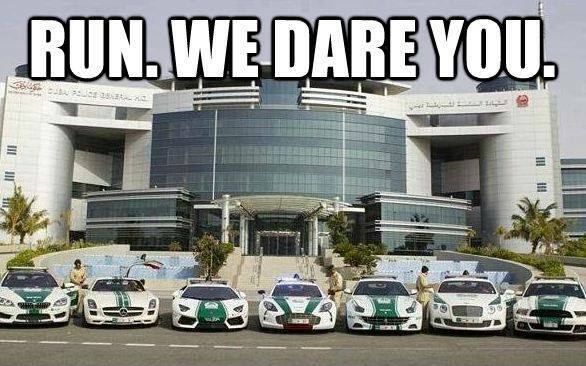 Career in the Dubai police force? I bet you want to learn about cars now.. I believe that this is an important issue that does need some proper discussion and debate. This article serves more as an introduction to what I believe is a much wider issue. I will be following this up with further posts about how in detail, I think cars (and motorsport) can be integrated into the school system in a way that is not only beneficial to the development of young people, but make education something more engaging. Keep Driving (and learning!) People! Shot with a Silver Arrow: Have Mercedes cracked the future? Driving us into the darkness. The Mercedes F015 concept. The recent New Year celebrations not only gave us the chance to wave a fond farewell to 2014, but it has opened our eyes to a whole new chapter. The past has been left behind. It is time to look forward into the abyss. It is the the single unknown that humanity cannot truly understand or predict; it is the future. In the dazzling lights of Las Vegas, surrounded by the vast Nevada desert the world has taken its first glimpse into what lies ahead. 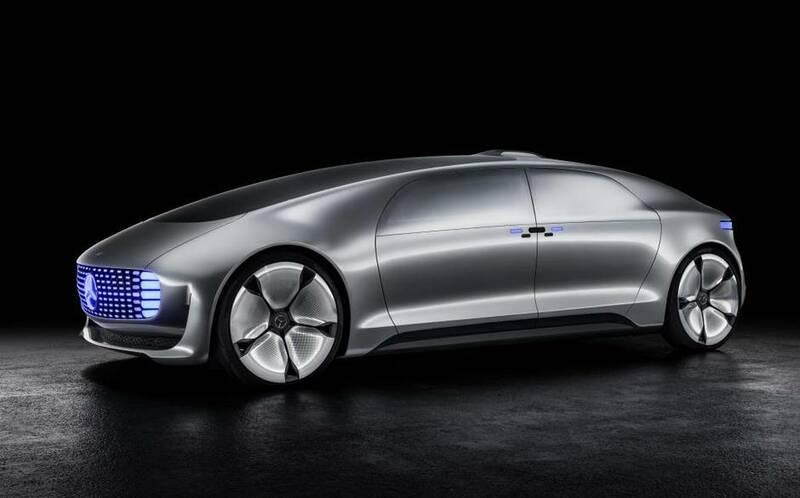 Mercedes have released the F015 Luxury In Motion concept that presents a vision of autonomous cars, powered by a hydrogen cell and electric motors. What I want to look into is not the technical specifications of this dream machine, but instead understanding the accessibility and utilization of future technologies. Have Mercedes cracked the future? 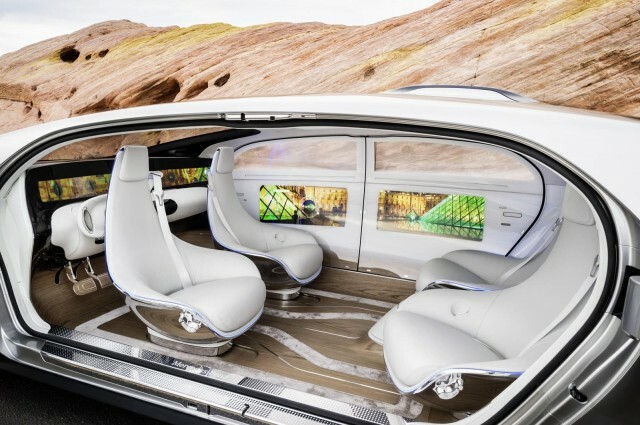 In reference to this paradigm shifting concept car, Mercedes Benz boss Dieter Zetsche believes that this car will transcend beyond its role as a mode of transport into a complete mobile living space. The key to this evolution is the rise of artificial intelligence; the car will be able to operate fully by itself with no input from the driver through the use of sophisticated cameras and sensors that connect to the central drive system. If this concept can come to fruition, those childhood fantasies and films may finally become a reality. However, with all these technological advantages, humanity may be forced to put all their trust into a completely autonomous machine. Even though the car can be driven manually, when the car is in self-driving mode the ‘user’ does not have to worry about driving at all. Speaking as a driver (through both necessity and passion), I believe that an autonomous vehicle will be met with a great deal of skepticism and a severe distrust. My first concern revolves around the reliability of any system, whether this be of the mechanical or computerized type. Online banking for example has eased the day to day stresses of banking, allowing us to check financial statements and make important payments on the move or in the comfort of our own home. However, online banking has opened up the avenues for computer hackers who steal our money right from under our noses without leaving a single finger print. If that example was not enough for you, then let us try this for size. Have you ever been working away on your computer, Candy Crush-ing your brains out on your tablet or updating your Facebook status on your phone and the whole thing just well, stops? Computer systems are getting ever more elaborate and sophisticated, but every now and again they will still go wrong. I guess it is very similar to how the human body can operate at maximum potential for most of the time and then spontaneously you malfunction and you are hit with the snot-sneeze-snort-laugh-sick in the mouth. 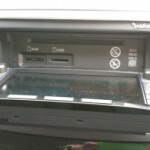 Could you honestly say that if you were left in the hands of a computer to drive you around, that you would not be worried about this computer having a snot-sneeze-snort-laugh-sick in the mouth? When a computer freezes, you can restart them, but what if a car froze at 70mph down the motor way? Most importantly, Zetsche said that this new concept would change the car from just transportation into a mobile living space, but I believe that the F015 is not really needed for that. For anyone who loves driving, the car is already more than just a mode of transport; your car is an extension of your personality. Something magical happens when you get behind the wheel and you do feel a deep surge from within you. There is not much that beats that feeling, of you, the car and the road. Not only that, but one cannot forget the trouser crossing feeling you get when you look at some of the metallic goddesses that have been created; Aston Martins, Alfa Romeos and Morgans to name but a few. 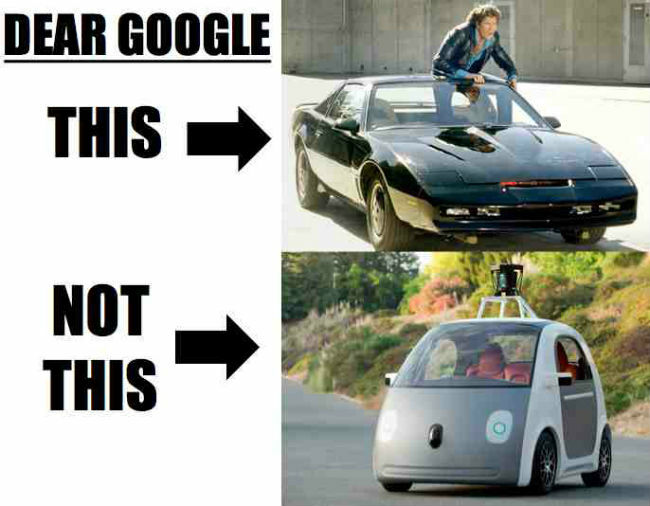 The Google self-driving car is the anti-drivers car, in both look and feel. I will admit that the F015 is definitely an improvement, but despite its futuristic awesome look I would still take something like a Porsche 911 or an Aston Martin DB9 any day of the week. I will never cease to be astounded by the classic German efficiency in dealing with issues before any one else even realizes they exist in the first place. And in the case of the F015 concept it is business as usual; the head of design at Mercedes Gordon Wagener has understood the concerns of the modern motorist and suggested theories to overcome this. The key is accessibility and relate-ability of the technology to the customer. Wagener has suggested that the key to the future is harnessing the technology in a way that does not overpower or intimidate the passenger. The overall aim of course is to make Mercedes THE brand name you associate with this new technology. You don’t use a vacuum cleaner, you use a hoover. You don’t use a ball point, you use a biro. You don’t use a smartphone, you use Apple. Therefore, you don’t use any autonomous vehicle; you use a Mercedes. If there were two key areas central to the development, they are of course design and materials. This may be the basic specifications, but Mercedes have understood that these variables must be linked by a rational constant; simplicity of interaction. The key to the success of this concept is the ease in which passengers can understand and use the car. In many cases, a great leap forward is often presented in a situation that may baffle and intimidate the user; it is an understandable reaction as there is an inbuilt human reaction to fear what we are not familiar with (or do not understand). Therefore, instead of multi-layered majestic complexity, Mercedes are aiming for minimalist simplicity. It is very easy to repeatedly add elements to blind your audience with the bright lights and the loud music; the real skill is being able to take things away in order to create a more finely honed finished product. If Mercedes are to succeed, then trust will be the final frontier they must conquer. Think of this like Iron Man; you can possess all the money and all the latest technology that the world can conjure, but until you receive the trust of those you are serving, you will never truly succeed. We may be sometime from bringing the stories of Herbie and Knight Rider to life, but the world of artificial intelligence is closer than we think. As it stands the F015 is nothing more than a concept, and will more than likely fall into the invisibility of time like many of these designs do. However, if this truly is the future, it will change the world of motoring forever. And honestly, if there was one car manufacturer from anywhere in the world that may just pull this off, they would be German, and they would be Mercedes (or maybe Audi). Let me know your views on autonomous vehicles! Follow me on Twitter @lewisglynn69! 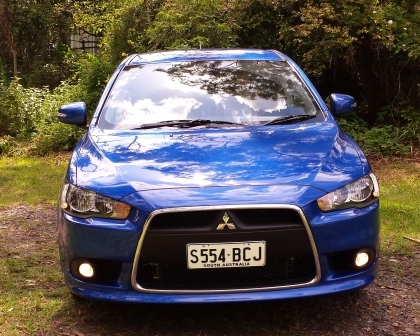 Around a decade or so ago, Mitsubishi released, in Australia, the Lancer based Outlander. It very quickly morphed into a bigger, more stylish vehicle than the compact and edgy original, leaving Mitsubishi without a smallish SUV styled vehicle. 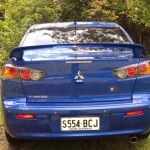 Some years later, the Lancer based ASX was released (and shared with Citroen and Peugeot). It started off as a semi harpish angled, petrol engined only machine and in 2015 is a softened slightly, diesel optioned chariot. A Wheel Thing talks to the torquey diesel ASX AWD. Oddly, that diesel is a 2.2L, rather than a possibly more logical 1.8L. The caveat here is simple: it’s only available with the selectable AWD (in Mitsubishi speak, AWC or All Wheel Control) system, in the LS and XLS variant (the XLS does come in 2WD petrol as well). The petrol engines spin 110kW at 6000 revs, the diesel has the same power but 2500 revs lower. Naturally, it talks the torque with a more than handy 360 Newton metres between 1500 to 2750 rpm, shading the petrol’s twist of 197Nm at 4200 rpm. 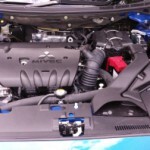 Mitsubishi quotes a combined consumption figure of 5.8L per 100 kilometres driven, from a 60 litre tank. I’d call that a range of 1000 kilometres (under the ideal driving circumstances, of course…). 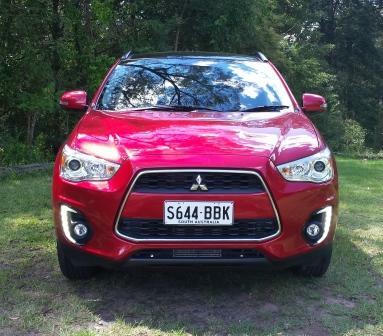 Perhaps Mitsubishi were looking at the economy vs weight, as the ASX XLS is 1530 kilos dry. 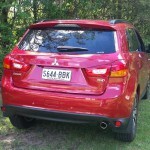 As did the Outlander originally, ASX has a resemblance to the host car (Lancer) at the front. The trapezoidal grille stands proud, identifying the ASX as a member of the Lancer family. The XLS tested comes with an AWD system, but the height of the car is that of the new breed of small SUVs, in that there’s a little bit of extra clearance but certainly nothing like, say, an Outlander. It’s squat, boxy in basic design, with enough curves to soften the overall impression. There’s been LED driving lights added at the front, wrapping the globe lit lights the ASX has had since release (bar the entry level) and, on the XLS, rolls on 215/60 Dunlop licorice wrapping some truly good looking ten spoke alloys. If you stand on a small ladder you’ll then notice a (almost) full length glass roof, with a curtain that rolls back at the touch of a button. Red LED lights add a nightclub style look, especially under dark skies. The test car was clad in Mitsubishi’s deep metallic red. You’d be hard pressed to pick it, unsurprisingly, from the donor Lancer car. It seats four comfortably, has a reasonable amount of room, colour LCD display for the driver with variable info displayed, chromed dials for the aircon, the flip out touchscreen with audio and satnav and the awkwardly placed (unusual for Mitsubuishi) heated seating switches, planted on the rear inside plastic centre console, right next to the seatbelt lock. It’s black on black for the trim’s lower half with the upper half a shade of beige. The rear seat is the now standard 60/40 split fold but rear cargo space is limited. 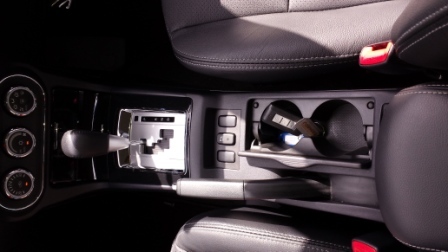 Drive selection is via paddle shifts on the steering column or traditional gear shift with sports mode. Audio wise, the XLS has the Rockford Fosgate system; it’s clear, punchy and will accept Bluetooh, USB and Auxiliary inputs, plus CD behind the fold up LCD navitainment screen. The plastics look ok however the overall ambiance is lacking compared to other vehicles in its class; it’s the standard ripple effect over the dash and doors, with a strip of brushed alloy look just above the chromed dials for the aircon and all housed in piano black. It’s no longer groundbreaking or out of the ordinary. Turbo lag is and will, more than likely, continue to be the bane of single turbo charged engines. 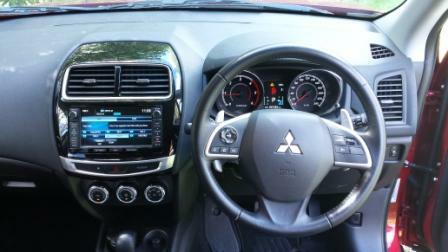 The 2.2L diesel in the XLS has it in spades with all throttle applications seeing the ASX waiting before it launches. Being a front wheel drive chariot (with a lockable AWD system in this), a hard launch will have the front tyres scrabbling for grip. It’s a traditional, torque converter style, six speed auto in the XLS, to deal with the mountainous torque available so low down, yet felt as if it was programmed to act like a CVT, with hesitation from Reverse to Drive and acceleration had the same CVT feel. Steering was light and the suspension wasn’t overly confidence inspiring, with the initial softish ride seeming to go into a compressed, hard mode too early on some surfaces, making the ride feel skittish and unrefined. Towing is ok for its class, up to 1400 kg (braked). The AWC system is engaged via a console mounted button, lights up a symbol on the dash but, really, didn’t feel as if there was a noticeable change in handling. Apart from the torque steer, it’s overall a neutral and predictable, if somewhat bland package. Rolling acceleration is rapid, thanks again to that torque spread, however I’d prefer to see that spread moved up the rev range by 500 or so revs to increase the overall driveability. It’s currently, arguably, the second newest design in the Mitsubishi garage, after the Mirage sedan and hatch, yet is somewhat held back by the Lancer underpinnings. The exterior design is unoffensive as is the interior although the full glass roof is a nice luxury touch. The diesel is possibly the highlight, offering around six litres per one hundred kilometres covered; it’s quiet, refined, pulls like a train but is geared to provide torque, in my opinion, a touch too low in the rev range, with torque steer an issue, given the absurdly low starting point for all of that torque through the front driven wheels. Although it seats four, the compact dimensions (just 4295 mm long with a wheelbase of only 2670 mm) preclude any truly usable rear cargo space when four are seated (just 393L), however that little issue is negated, naturally, if only two people at most intend to be passengers. Although fitted with a switchable AWD system, the ride height of under 20cm unladen would also limit any off road usage to smooth gravel style roads, although the diesel, with that aforementioned torque, would probably haul the ASX over some mild rocky terrain if driven judiciously. 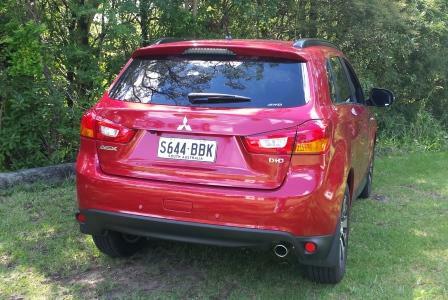 For my money, the ASX and its French badged brethren are what’s wrong and right with the smaller SUV category: wrong because they’ re really not used as an SUV and at the cost of a sedan’s usage, right because they do provide a cost effective and smaller packaged solution for those that may not need the next step up. 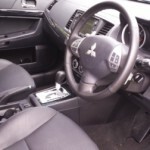 At the time of writing, Mitsubishi Australia had some pricing specials available across the range, with a driveaway price starting from $24990 for the entry level up to $36990 for the diesel XLS. 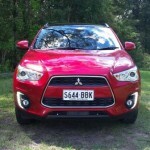 Head across to http://www.mitsubishi-motors.com.au/vehicles/asx to price up your ASX. For other pricing options, chat to us at Private Fleet. 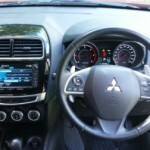 The Car: Mitsubishi ASX XLS. 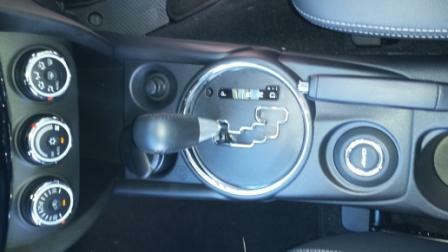 Transmission: six speed automatic, non CVT. Dimensions: 4295 x 1770 x 1625 (L x W x H in mm). Take a look at your average sized postcard. Not very big, is it? Now imagine four of them at the corners of something measuring about 3 × 2 metres or so. They don’t take up much of that space. However, in the typical car, this is the sort of area your tyres take up when they actually contact the road: roughly the size of a postcard. 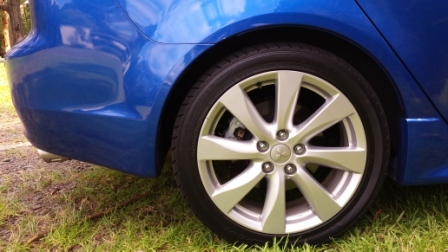 Of course, a fatter tyre will have more surface area contacting the ground – they don’t just look good. Those of you who fell asleep in high school science class when they talked about friction had better wake up and pay attention now. Everything to do with staying safe on the road is to do with friction. Inside an engine or a car, friction is bad news. It makes an engine less efficient and wears things out more quickly – which is why you need to keep up the fluids and why you should check your oil regularly. However, you need friction and lots of it with your wheels to help your tyres grip the road and to help your brakes stop the wheels spinning. It’s not all that smart to head out onto the road to get an idea of how lack of friction and low grip affects your turning ability. So try a simple experiment on a piece of smooth, freshly polished floor – a school corridor or a big kitchen will do. Set up a slalom course with lots of sharp twists and turns. Also include a track segment where you have to run full speed, then stop sharply. First of all, simulate ordinary conditions with good tyres by running this course wearing sneakers with lots of tread. Not too hard, is it? Next, have a go at simulating the effect of tyres with little or no tread: take your shoes off and do it in your socks. Sue yourself for damages if you fall over or crash into a wall. Lastly, pour water all over the floor and try again, either with the sneakers or without the sneakers. You can probably think of some other simulations to try, such as running the course in high heels (space saver tyres), pouring oil over the floor, having one shoe with tread and one without tread, etc. However, somebody’s probably going to complain about what you’re doing to the floor at this point. But you get the picture. The point of this crazy exercise is to demonstrate that if your tyres are worn or if the road is wet, you are going to lose control or not stop in time when braking. Your car might have all the safety devices in the world – traction control, EBD, lane change warnings, collision avoidance systems, rollover protection and all the rest of it – but if you’ve forgotten to check your tyre tread, all these extra bits won’t do an awful lot. Check your tread depth. The grooves should be no less than 2 mm deep. A lot of tyre shops have little cards you can use to check tread depth, but you can also make your own by playing around with a ruler, a vivid pen and a tag off a packet of sliced bread. Do this regularly – it’s all too easy to forget to do it, but you should schedule it in. Maybe monthly? Make sure that your tyres have the correct pressure. Each car has its own preferred pressure. You’ll find this helpfully stamped somewhere around the car – under the fuel flap, on a plate in the driver’s door or in the vehicle handbook. This may need to be adjusted if you’re doing a lot of towing or have a heavy load to carry (or if you do a lot of high speeds – but if you’re a racing driver, you’ll have a crew that helps you in this department). Don’t guess – use a proper gauge. A lot of air pumps have good gauges on the hose thingummy. Rotate your tyres regularly. Different tyres wear at different speeds depending on your drivetrain, your suspension and where the loads are in your car. Rotating means that your tyres wear out more or less evenly and the ones that really do a lot of work will have plenty of tread. They day that every 10,000 kms is a good schedule for rotating tyres. Exactly how you rotate your tyres will depend (again) on your drivetrain and whether or not your spare tyre is a space-saver or a full-sized one. 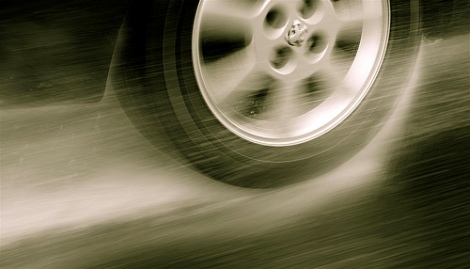 Keep up the wheel alignments – twice a year is recommended. This also helps the tyres to wear evenly, so you know that if you’ve got 2 mm on one part of the tyre, it’s going to be like that on all the other parts of the tyre, too. Tyres are not something I’m ever going to neglect. Not since the time I was in a crash that happened because the car lost traction thanks to bald tyres. The driver wasn’t hurt and neither was I, but the car was written off. You don’t forget a lesson like that in a hurry. 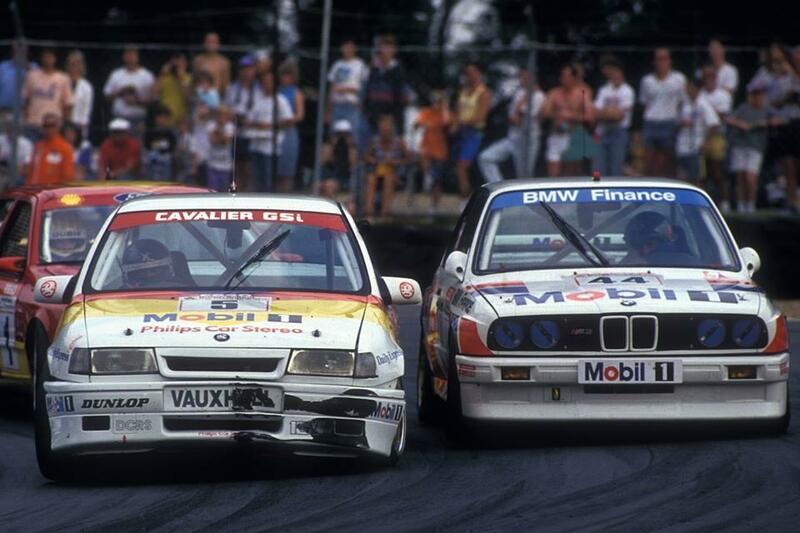 The British Touring Car Championship is often remembered through its champions, its glorious victories and those heroic comebacks. However, there has always been more to the BTCC than just the winners. Something that has always made the championship so special is the combination of characters that comprise the field each year. Patrick Watts was always one of those characters, competing in the BTCC between 1992 and 1997. He also made a spectacular return to the BTCC Masters Race in 2004, and continues to compete in the HSCC Super Touring Trophy. He may not have ever had any championship success, but without Mr Watts the BTCC would not have been the same. The personification of perseverance could only ever be Patrick. Patrick Watts flirted with the BTCC in the 1980s when he made numerous appearances in cars spanning the different classes (with the exception of Class A); his best performance came in 1984 when he competed in a few races in an MG Metro Turbo (Class B), finishing as high as 6th at Silverstone. It was only in 1992 when Watts decided enough was enough and it was time to tackle the BTCC head on. Back in 1992, the championship was in its infant years of the 2.0 litre Super Touring regulations and as such many drivers, teams and manufacturers were still finding their feet. 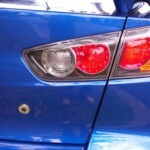 So when Patrick Watts entered with a Mazda 323, no one really battered an eyelid. As any lifelong fan of the BTCC, watching back the old season reviews is a must, even if only to relive just how truly great the 90s were for touring car racing. Personally speaking, 1992 has always been one of my favourite years to watch due in the most part to the non-stop action from the get-go. As a result of this, the poetic narration of Murray Walker will forever remain in my head; from my recollections Patrick Watts was never often spoken of too highly. The combination of ‘Patrick Watts’ and ‘gravel’ spring to mind. Looking over his 1992 statistics, Watts failed to finish 50% of the races, with a highest finish of only 11th. In his defence however, it was the first year in the championship for Mazda and they were running an under developed car that was almost consistently running off the pace. As 1993 rolled around, Watts and Mazda refused to see a repeat of the previous season. Not only did they develop a Mazda Xedos 6 into a competitive car, but they adorned it with a striking livery just to announce to the world that they were there and they meant business. There was however one problem. When it comes to touring car racing, a graph could be drawn charting driver aggression and grid position. Funnily enough, the further up the order you go, the more you experience the wrath of the aggressive driver. 1993 was therefore an equally disappointing year for Watts, although unlike the previous year he just happened to be in the wrong place at the wrong time. He may not have finished 7 of the 17 races, but he did achieve three 4th place finishes and numerous front row starts. His bad luck was most apparent at the famous Snetterton race where the entire field appeared to crash in the opening seconds; Watts was one of the few cars that got a clean start but lost control in the first corner and ruined his car. Such hope, such opportunity, lost. 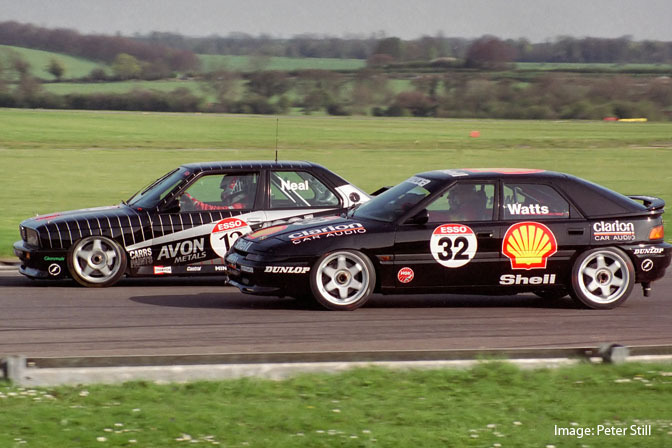 The end of 1993 also ended the partnership between Watts and Mazda; Mazda would not continue as a works entry in the BTC apart from a semi-works outfit that competed in half the 1994 season. From 1994 to 1997, Patrick Watts joined the Peugeot team which is how I will always remember him. 1994 saw the ever persistent Patrick finally manage a competitive season, finishing 8th in the overall standings. In 21 races, he would only retire 3 times, would in the majority of cases finish easily within the top 10 and he even achieved two podiums at Brands Hatch. In addition to this impressive year, something happened in 1994 that would cement his place in the touring car history books. In a time before Plato, it was Patrick Watts that quite clearly would go on to like Shaggy. The phrase ‘It Wasn’t Me’ was one uttered by the bespectacled gentleman on numerous occasions. The most famous occasion was at Brands Hatch where approaching Druids, Watts had a certain Paul Radisich in the Ford in front of him, and appeared to push him out the way and into the gravel. Watts however denied the whole thing and argued that he did not push. 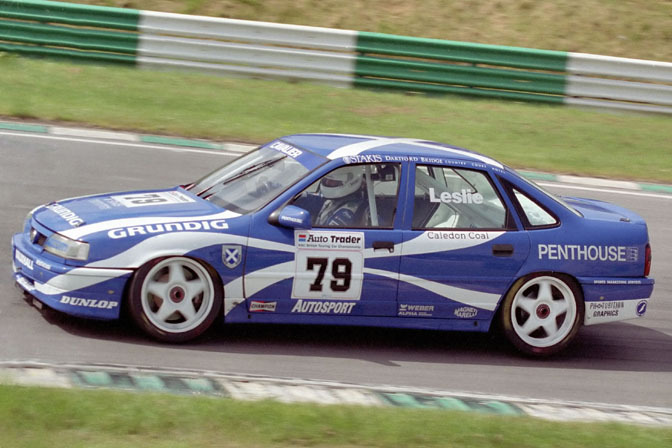 This continued until the end of his BTCC career at the end of the 1997 season. Sadly, the relative successes of 1994 were to become a mere candle in the wind. As Peugeot Sport became Total Team Peugeot in 1995 and 1996, Watts would return to his old ways once more. He did however manage a 2nd place at Snetterton and a 3rd at Thruxton in 1995. It would be a fair statement to say “the less said about 1996 the better”. In a season of 26 races, Patrick Watts would only cross the finish line on 10 occasions. So that is a grand total of 16 races he did not finish. His best result was an 8th place at Brands Hatch. Therefore it did not come as much of a surprise that Total left Peugeot as a title sponsor at the end of the year. The 1997 season was the first year of the Esso Ultron team, and who better to spearhead the campaign than Patrick Peugout Watts. Unfortunately, unlike in 1993 where a striking new livery brought improvement, 1997 was sadly nothing to write home about for Patrick. He would finish the year in 16th place with only 26 points to his name. 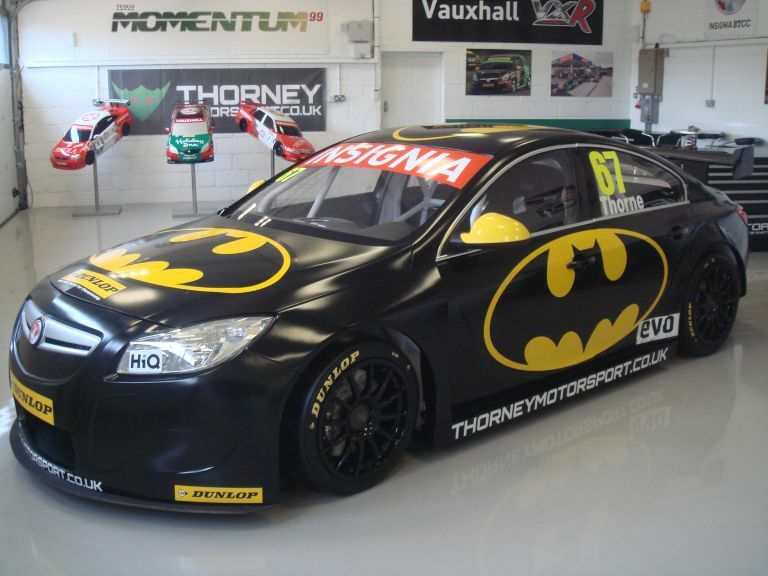 This goes some way to explain why this would turn out to be his final season in the BTCC. The saddest part was that in Germany the same car was an all conquering winning machine, but the British team were wrought with financial woes and internal struggles. The following year would see Watts replaced by former Ford driver Paul Radisich, who arguably struggled even worse than Watts. Peugeot were never really cut out for the BTCC. Poor, poor Patrick. What I have always loved about Patrick Watts (as you may have guessed by now) is his passionate determination in the face of adversity. In 1999, he decided that he was not yet done with the Peugeot 406, and entered the opening rounds of the Australian Super Touring Championship. And finally, after years of trying everything paid off; he got himself two 2nd places and one victory. It is just a shame that he did not enter the full season; his pace was so competitive that he could have challenged for the title. At the final meeting of the 2004 BTCC season, the championship hosted a ‘Masters’ event that brought back the big names from the British championship from the last 20 years or so. It was only fair that Patrick got himself a drive, it just wouldn’t be the same without him. In an almost classic-Watts style, he would finish the race classified as DNF, after a collision with modern ‘It Wasn’t Me’, Jason Plato. Typically neither would except blame for the collision. After all, it wasn’t them. The magic that makes the BTCC so special can be defined only as vibrant variety; a combustibly wonderful combination of characters, teams and drivers that contribute to the championship we all know and love. The world of BTCC would not be the same if it was not for Patrick Watts, who is the true embodiment of determination. He may never have got the success he deserved, but he fought on gallantly doing what he clearly loves. His success in 1999 is proof that perseverance does pay; through hard work and determination, anything is possible. Well, maybe not a touring car championship, but all in good time. I did always feel sorry for Patrick Watts; he had everything that a champion needed yet luck was never quite on his side. He would always be in the wrong place at the wrong time, often getting caught in the aftershock of collisions. If everything I had said so far was it, then that would be enough. But the final cherry atop the icing of the beautiful cake that is Patrick Watts is the fact that in the last few years he has brought his 90s dream to fruition. He has entered his Peugeot 406 from BTCC days into the HSCC Super Touring Trophy and has been achieving notable successes against the likes of historic foes such as John Cleland. The development of his car has led to him finally becoming ‘THE man to beat’ in the historic field. Patrick Watts: the man, the legend, the perseverance. May you continue your legendary chapter in the eternal history books of the BTCC. 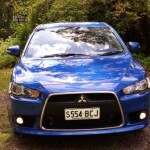 Seven Year Itch: Mitsubishi Lancer XLS Sedan. 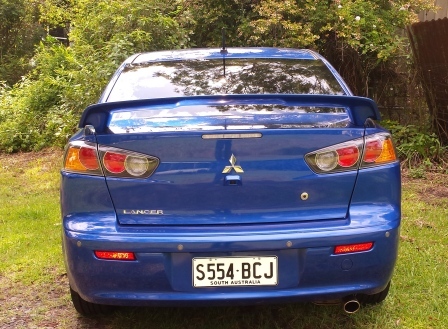 The Lancer nameplate has been around, under both Chrysler’s and Mitsubishi’s wardship, for over forty years; the current model was released in Australia in late 2007 and judging by Mitsubishi’s cycle for the car, it’s looking like an update isn’t (hopefully) far off. A Wheel Thing goes one on one with the (current) top of the range XLS sedan with CVT and petrol engine. 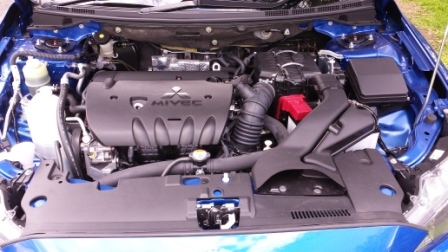 Take a 2.4L normally aspirated four cylinder, petrol powered engine, bolt it to a constantly variable transmission (CVT), make it spin out 125 kW and 226 metres of Mr Newton’s best, lob it behind the bluff and upright nose of the 2015 Lancer and there’s your basic mechanical package for the Lancer XLS. 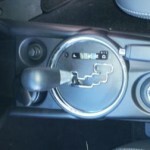 There’s the now common Sports mode, with flappy paddles attached to the steering column. It’ll quite happily swallow standard 91RON unleaded and is rated at a slightly high 8.5L consumed per one hundred kilometres travelled from its 59L tank. The concept car was shown at the Tokyo Motor Show in 2005, with the first models off the production line sold in the U.S. in early 2007. Gone was the laid back nose cone with almost triangular shaped headlights (think the final Magna in Australia), replaced with a squared off, forward leaning, trapezoidal grille design with eagle eye headlights. The cabin remained largely unchanged on the exterior side whilst the rear copped a nip and tuck with a “cheek” left for the tail light cluster. There was the addition of the “Sportback” but the delisting of the wagon variant. The XLS comes with a tasteful rear deck lid spoiler, 18 x 7 alloys wrapped in 215/45 rubber. The spare is a space saver. The chrome surrounded grille is split by a large horizontal beam, at bumper line level, and framed by globe lit driving lights pushed to the bottom of each corner. 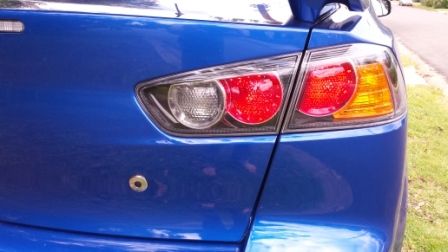 Oddly, there’s no LED’s…..
It’s a case of evolution for the Lancer with changes compared to the previous model minor but noticeable. There’s the now standard colour LCD display flanked by the speedo and tacho dials in the dash, keyless start (with a rubber tab on the door handles for access) but a knob where the key might go is still to be turned (! ), the now familiar touchscreen for audio and navigation in the centre dash, faux leather seating/steering wheel/gear knob, alloy pedals, the hugely simple but effective rotary dials for aircon. 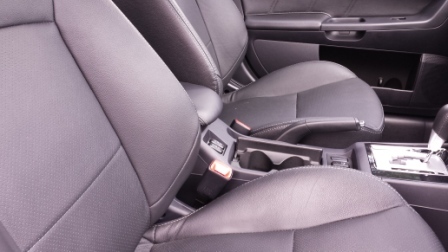 There’s a faux leather insert for the doors and the same, uninspiring, barely soft touch plastics on the dash; instruments, though, are housed in a simple and tastefully integrated binnacle. The centre console, framed by the heater buttons for the seats, feels flimsy and the storage locker lid is too low for support. Plastic trim is a combination of dull lustred ripple effect and almost piano black (it’s more a very dark grey) strips from dash through to doors. 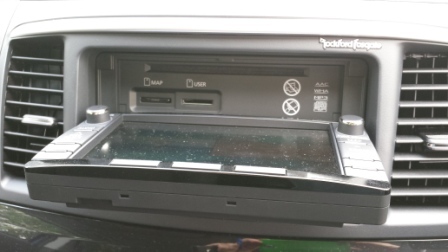 The touchscreen system folds up to provide access to a CD slot and SD card access, although, bafflingly, the USB port is, still, in the glove box. Very inconvenient, quite simply. 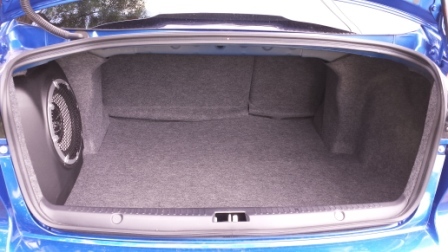 Storage in the rear (377L boot space) is accessed via pushbutton on the tailgate, a lever at the bottom right of the electric driver’s seat, the splitfold rear seats or via a button on the keyfob. Normal capacity is 400L however the subwoofer unit for the 9 speaker Rockford Fosgate audio system takes up a chunk. Audio quality itself was quite good but (to be nitpicky) the location of the subwoofer was audibly noticeable, with subs meant to be not audibly locatable. 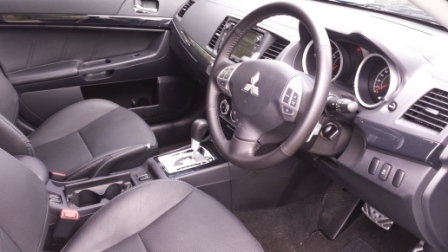 Safety is taken care of via curtain airbags, knee airbag for the driver and Mitsubishi’s energy absorbing chassis construction, plus rear park sensors and camera and ISOFIX child seat mounting points. The XLS Lancer is not a heavy car at just 1360 kg dry, with a gross mass under 1900 kilos. Peak torque is seen at a high 4100 revs, however the CVT transmission does a decent job of putting power down through the front driven wheels. Loaded with four occupants, it sits nicely in the road but has an odd sensation of the rear feeling a touch more floaty than the front. Steering is light, nicely weighted but doesn’t seem as if it offers a lot of conversation though. The ride is even, level across most surfaces, even with the low profile rubber; it tracks truly, rarely upset by any road influenced changes. Braking is safely progressive, with enough pressure through the pedal and lack of intrusion from the ABS system to provide a user friendly level of confidence. It’s not hugely rapid under acceleration however will move you along decently, for normal driving; handling through tight corners such as roundabouts does indicate a measure of push on understeer but at no time are you left wondering if the car will go out from underneath. Naturally though, if you go in TOO hard then there’s a good chance of an issue….On a flat road, it’s firm enough, with enough softness to provide a level of comfort befitting its luxury orientation. The CVT is fluid enough; with the change from a rise in revs to a preset point to a programmed feeling of more like a “normal” auto, there’s the sensation of gear change now and, with the Sports Mode, there’s the semi manual option available which is probably best used in a straight line situation. On a downhill run, foot off the go pedal has the CVT “braking” the car and on the flat, there’s a moment’s hesitancy before the transmission feels as if it clunks then drops back a gear. The Lancer’s biggest disadvantage is its age; to give a comparison, Kia’s Optima, a bigger car, uses the same capacity engine, at 2.4L. That powerplant provides 148kW and 250 Nm plus quotes 8.0L per 100 km. It uses direct injection, fuel directly into the combustion chamber from the injectors, rather than breathing from a rail into which petrol is injected. Economy overall varied, with stop/start traffic pushing the figure well over 10.0L per 100 k’s whilst good freeway runs dropped it to around 7.5L per 100 kms. Therefore, running costs for such a small car aren’t as good as they should be. Although not unattractive, it’s been left behind by its two main Korean rivals and by its Japanese rivals in styling. 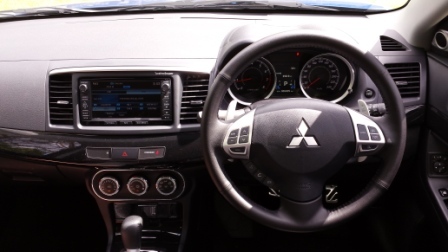 Sitting at close to the top of the Lancer tree, to still twist a knob to start although it’s keyless entry and to have a media port in the glovebox rather than in the centre console is also historic. 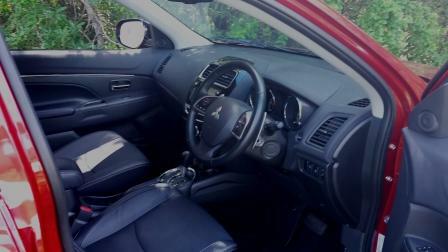 Ride quality, fit and finish, engine and CVT all work well enough but the overall impression from my driver’s view is that the Lancer is now a generation behind. 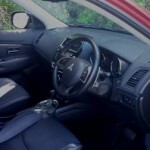 For specs and pricing, go here: http://www.mitsubishi-motors.com.au/vehicles/lancer/specifications/sedan. 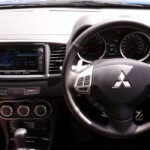 The Car: Mitsubishi Lancer XLS sedan. 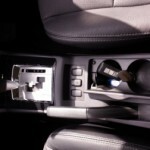 Transmission: Constant Variable Transmission with six preprogramed shift points. Economy: (combined, claimed) 8.5L per 100 kilometres. 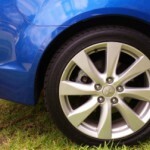 Wheels/Tyres: 18 x 7 inch diameter, 215/45 R18. Dimensions (L x W x H in mm): 4570 x 1760 x 1490. Servicing: 12 months or 15000 kilometres, roadside assist if car serviced under capped price servicing. Check your tyre tread depth. Never mind the fact that this is often a condition for getting roadworthiness certification, it’s also plain old safety. Sure, in winter, you’re more likely to hit wet patches on the road that bad tyre tread could skid over, but we’ve had some pretty wet periods over summer, haven’t we? Water-skiing, as far as I am concerned, is best done behind a boat on a quiet lake or harbour, not on the road. ABS and all the other driver assistance thingummies they put in car brakes these days can only do so much. Have an emergency kit in your car in case you’re stuck for ages. Their suggestion was to carry snacks, water and something warm to put on. All those who have to Mum’s (or Dad’s) Taxi probably know about this one already, especially if you have children under the age of 10 and/or a diabetic child (who needs to carry emergency food supplies), or who live in a changeable climate that can produce sudden downpours. Just remember to change the water periodically so it doesn’t give you dysentery. I would also add some form of entertainment, preferably of the printed kind that can be read aloud if necessary. If stuck for ages, you can only read the car manual so many times and manuals are useless for entertaining small children unless you rip the pages out and fold them into darts. Check the level of your windscreen wiper fluid. Again, excellent advice, especially if you’ve ever been splattered by effluent from a cattle truck, which can happen at any time of year on a rural road. The pamphlet also suggested carrying extra water to top up the wiper fluid just in case. Don’t forget that plain water can be used as drinking water and to top up the radiator as well as the wiper fluid. Carry a cloth for wiping condensation off the windows. 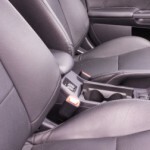 This can strike at night or on a cold day in summer if people are sitting in the car with the windows up for ages. The pamphlet recommended a microfibre cloth that cleans the inside of the windscreen at the same time as it removes the condensation, but anything soft and absorbent will do – even your sleeves. Hints, Surprises and Wows From Detroit. Detroit. Motor City. The once thriving city once again hosts its annual Motor Show, the North American International Auto Show and, as expected, the unexpected has been unveiled, as have some truly good looking cars. Motive power would be, at this stage, a 2.0L diesel, with over 400 Newton metres of torque, matched up with Hyundai’s well proven 4WD system and showcases Hyundai’s innovation by having an expandable load bed and tailgate extension. Hyundai research also shows a swing away from traditional utility style SUVs in the US; women who buy more than half of all CUVs sold in the U.S., now account for only 10 percent of pickup sales. Hyundai also unveiled its Sonata Plug-In Hybrid; with a 9.8kWh lithium ion battery, the Sonate should have a 35km all electric range. A 2.0-litre Nu four-cylinder GDI engine coupled with the electric motor allows the Sonata Plug-in Hybrid to operate just like the Sonata Hybrid once the onboard battery charge is depleted. Sonata PHEV’s Nu engine produces 115kW and 190Nm of torque and the total system output is 150kW at 6,000 rpm. Ford showcased its anniversary GT40; to be sold under a new, umbrella organisation called Ford Performance, the sleek, low slung two seater may be powered by a twin turbocharged 3.5L engine, producing over 600 horsepower. A team of designers, headed by Todd Willing, the head designer for Ford Asia Pacific, penned the edgy yet curvy beast. Built from weight saving carbon fibre, the GT40 features an active rear spoiler and upwards swinging doors. There’s two other vehicles released as well; a Shelby Mustang GT350R and a ten speed automatic Raptor. The Mustang will be powered by a 5.2L flat plane V8, pushing over 500 horsepower to the ground via a six speed manual and limited slip diff. Aimed at primarily track users, there’s been a weight shedding program, including carbon fibre wheels, removing the rear seats, radio and aircon. The Raptor will have a 3,5L V6 EcoBoost twin turbo engine, multiple drive modes, an aluminuim body and that ten speed auto was codeveloped with General Motors. Honda (Acura in the US) went back to the future with a long rumoured car, the NSX. Taking styling cues from Lamborghini, Aston Martin and Ferrari, the mid mounted, twin turbo hybrid engine is expected to pump out 550 horsepower via a nine speed automatic. There’s, apparently, a range of driving modes, including “Quiet” (presumably a more electric mode) and prices are said to be at around $150, 000. Although Holden will close as a manufacturer, its much vaunted design studio showed why GM will keep it running, with two utterly different concepts being show. An almost Barina sized, glass roofed, electric car, the Bolt bookended the Buick Avenir, a large car with plenty of tech, such as a twelve inch touchscreen, wireless mobile device charging and wifi hotspotting. It will roll on 21 inch diameter wheels and will seat four in sumptuous comfort. The projects were started and finished in the Port Melbourne based design studios. Again, no confirmation as to whether either will go into production. Staying with General Motors, there’s a school of thought that says a two door, four seater car rumoured to be coming to Australia will be the Corvette, not, as some think, the Camaro. The latter hasn’t been engineered for right hand drive although it would be a logical and ideal match for Ford’s Mustang. Stefan Jacoby, head of GM’s International Division, wouldn’t be drawn on exactly what it would be, saying only “We will bring a true sports car to Australia for the brand Holden,” “It will be something which fulfils the requirement of a true Holden sports car.” Expect it to arrive in 2018. Since You’ve Been Gone: The End of Vauxhall in the BTCC? If you turned the clocks back 10 years, you would probably be mistaken for thinking that the BTCC was in fact called the British Touring Vauxhall Championship. Throughout the 2000s, the name ‘Vauxhall’ characterized what it was to race in the championship. Vauxhall and Triple Eight were a driving force behind consistent championship success. 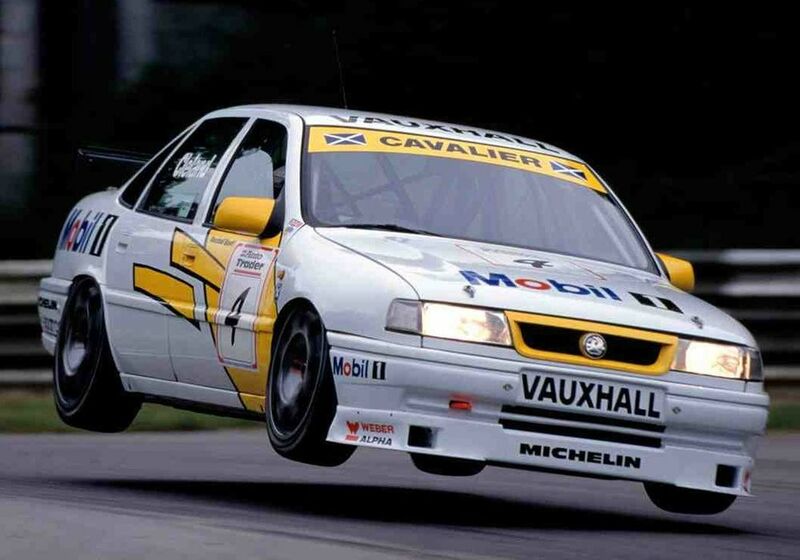 For those history heads, Vauxhall has been a name associated with the BTCC since 1989. Alas, in recent years they have become an endangered species until last year when the single surviving member of their species was lost. Is this the end for Vauxhall? 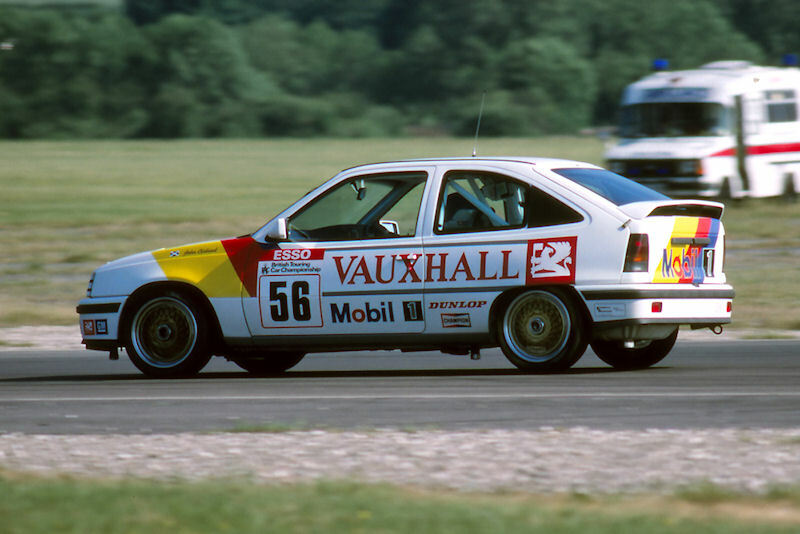 The Vauxhall journey began back in 1989 when a little known Scotsman named John Cleland entered an Astra GTE (Class C) and walked away at the end of the year with the overall drivers championship. Cleland and his Vauxhall were able to blitz the rest of the Class C field and even battle with the Class B BMW’s. The next year saw the 2-litre formula beginning to take shape, although the monstrous Class A Sierras remained for one final year. Vauxhall entered the larger Cavalier GSI, although 1990 saw Cleland lose out in the class honours to the BMW of Frank Sytner. The overall title in that year went to Robb Gravett in the Ford Sierra. Between 1991 and 1994, the backbone of the Vauxhall manufacturer team would always be the potent combination of John Cleland, Jeff Allam and the Vauxhall Cavalier. The team would never win a championship outright (although Cleland did come tantalizingly close in 1992 as we all remember). Alongside the factory team, Ecurie Ecosse also entered two Vauxhalls in 1992 and three in 1993; David Leslie was the stand out driver for the team and even got a rather patriotic livery to go with it. This independent team was run by RML, which in 1994 switched to the factory deal following their success with Leslie in 1992/1993. Following the controversial Alfa Romeo championship victory in 1994, the regulations were amended for 1995 allowing for the addition of wings, even if they were not standard on the road car. The partnership of Vauxhall and RML was a winning combination in 1995; John Cleland won his second championship after a season long battle with the Volvo of Rickard Rydell. Cleland’s team mate James Thompson also got a race win at Thruxton. Little did anyone know what this young driver would achieve in years to come. After 6 years in the championship, 1995 was the final curtain call for the Cavalier as the works car. 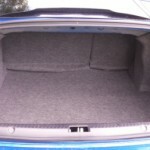 As 1996 rolled around Vauxhall switched to the Vectra which lacked much of the performance always held by the Cavalier. In the final year with the RML partnership, the only spoils came with a chance victory for James Thompson at Snetterton. From 1997 until 2009, the legendary Triple Eight Engineering (formed by Derek Warwick and Ian Harrison) would run the Vauxhall works effort. In their inaugural year, Vauxhall (now piloted by Cleland and Warwick) endured a tough time, struggling to be on the pace with the Renaults. However, in 1998 the cars were significantly more competitive and Cleland managed two race victories, both of which came at Donington Park; the second of these is arguably from one of the greatest races the sport had ever seen when Nigel Mansell nearly won the very wet feature race which he had started in last place. 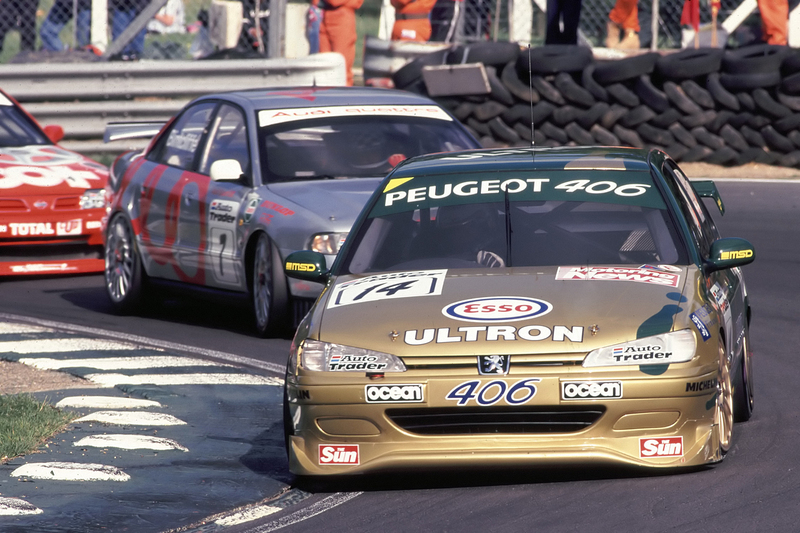 The final two years of the Supertouring era were more competitive for Vauxhall; gaining a race win at Brands Hatch for Yvan Muller after completing a near impossible overtake at Paddock Hill. Cleland retired from the BTCC at the end of 1999, leaving his seat to be filled by ex-Renault man Jason Plato and the addition of Vincent Radermecker for 2000. Vauxhall had a sniff at the championship in 2000, but sadly they could not keep up with the all-conquering Ford team who won the title with Alain Menu. 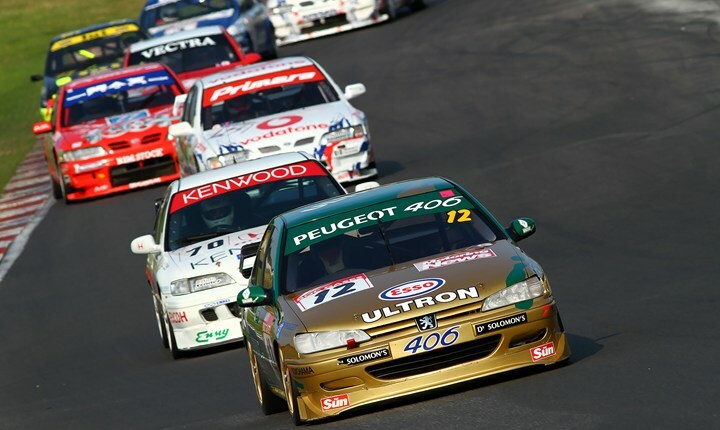 The new era of BTCC in 2001 (BTC-T regulations) began what would become an almighty dominance from Vauxhall, who were the only returning manufacturer from the 2000 season. In 2001, Vauxhall would win 25 of the 26 races, with only MG spoiling the fun at a wet Brands Hatch at the end of the year. They fielded two teams, the works team and egg:sport; Peugeot, Alfa Romeo and Lexus never stood a chance. One of the only memorable moments of the year was the season long battle between Plato and Muller, who struggled to work as team mates (to put it lightly). From 2002 – 2004, the Vauxhall pairing of Yvan Muller and James Thompson would share the titles between them, two for Thompson and one for Muller in 2003. Vauxhall must have suffered a massive case of deja vu in 2005/2006; just like in 1996/1997 they introduced a new model (this time the Vauxhall Astra Sport Hatch) but were not in a high performance position to challenge for the titles, which in both years went to Matt Neal in the Halfords Honda Integra run by Team Dynamics. Colin Turkington and Yvan Muller may have departed the VX-R team at the end of 2005, but it did pave the way for World Touring Car driver Giovanardi; 2006 was not the best time for Giovanardi, who was in a car that was developed for Yvan Muller (who coincidentally had moved to take on the WTCC) which consequently suffered on his performances. He did however managed to take a race win that happened to be the 100th BTCC win for Vauxhall. 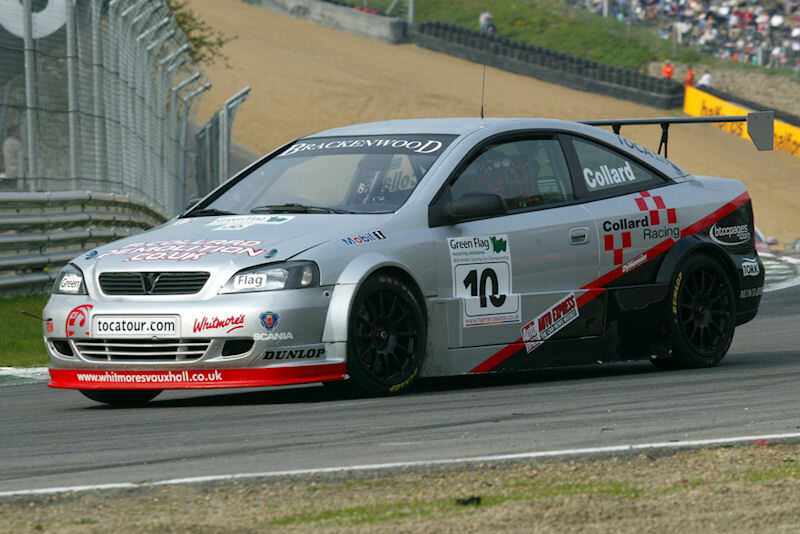 The switch to the Vectra in 2007 was the final hurrah for the VX-R team; Giovanardi took a thrilling championship title in 2007 after an amazing final race at Thruxton. He repeated his success in 2008 with a comfortable championship win. 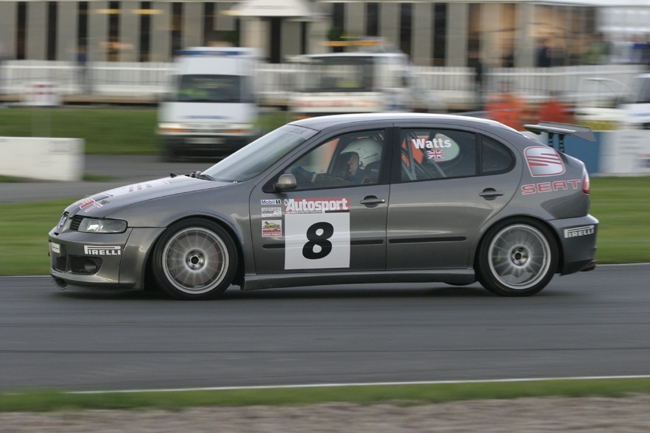 By 2009, VX Racing were the only factory support team, but even the dangerous combination of Vauxhall and Giovanardi could not stop Colin Turkington from winning the title. 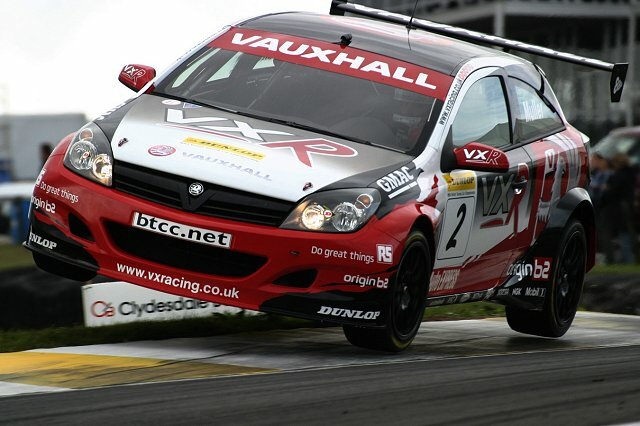 By the end of 2009 Vauxhall had made their decision; they were to pull out as a manufacturer in the BTCC. It was the beginning of the end; one of the greatest racing empires had crumbled. But it was not the end for Vauxhall just yet. The final few years of Vauxhall in the BTCC was as an independent effort. It says a great deal about the strength, performance and affordability of the Vauxhall as a machine in the sense that it was probably the most used car as an independent machine between 1991 and 2014. 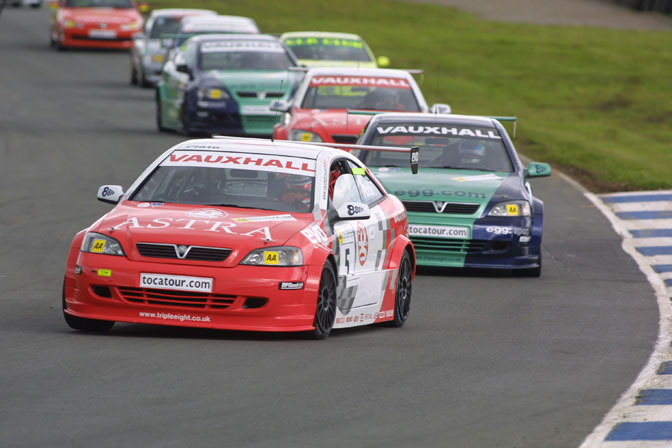 From Jeff Wilson running a Vauxhall Belmont in 1991, to Chris Goodwin in a Demon Tweeks Cavalier in 1993, to Mark Blair’s Vauxhall Vectra in 1999, even to Rob Collard’s Vauxhall Astra in 2003/2004, a Vauxhall appeared to be the car of choice for private entries. 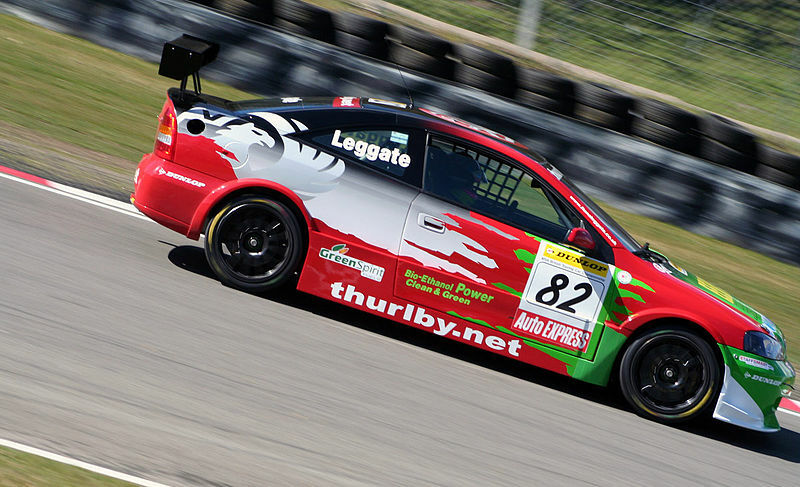 Triple Eight continued to run Vauxhalls in the championship, but in 2010 they most definitely ran into some issues, making their way through multiple drivers including Giovanardi, Phillip Glew, Sam Tordoff before eventually settling on James Nash. On the other hand, 2011 seemed to be looking up for the fledgling team, having finally sorted the crippling sponsorship problems that had ruined their 2010 campaign. James Nash was blisteringly fast throughout the year, eventually winning at Rockingham, taking the overall Independent title and finishing joint 4th overall with Mat Jackson. Triple Eight switched to run the MG-factory team from 2012. 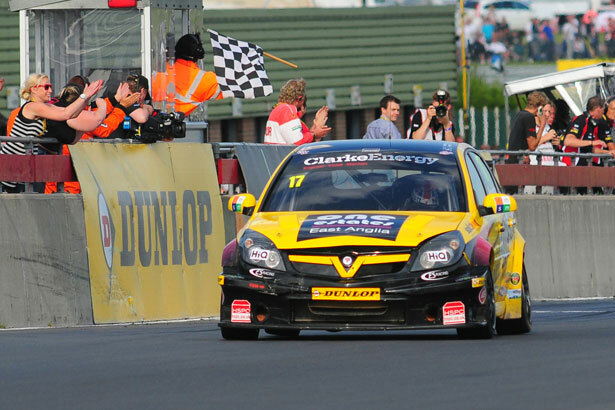 Dave Newsham now holds the honour of being the last driver to ever take a Vauxhall to victory having won at Snetterton and Knockhill in the 2012 season. It was in the same year that the Vauxhall Insignia was introduced by John Thorne of ‘Thorney Motorsport’. It is fair to say that Thorne was much more of an owner/engineer than a racer; this is the man who once managed to spin out of control on the warm up lap. It was in 2013 that a Vauxhall would see a whole season for the final time; Lea Wood won the Jack Sears Trophy in the S2000 Vectra and Tony Gilham ran the two ex-Thorney motorsport Insignias, with drivers including Jack Goff. One of the highlights of the Insignia was Jack Goff harassing Gordon Shedden for the race win in the final round of the year at a drenched Brands Hatch GP. As we reach 2014, Team BMR entered two Insignias as part of the 4-car team for Jack Goff and Warren Scott. However, these were eventually switched to the ever-improving Volkswagen CCs. After 25 years glorious years in the worlds best touring car series, the age of extinction has hit. 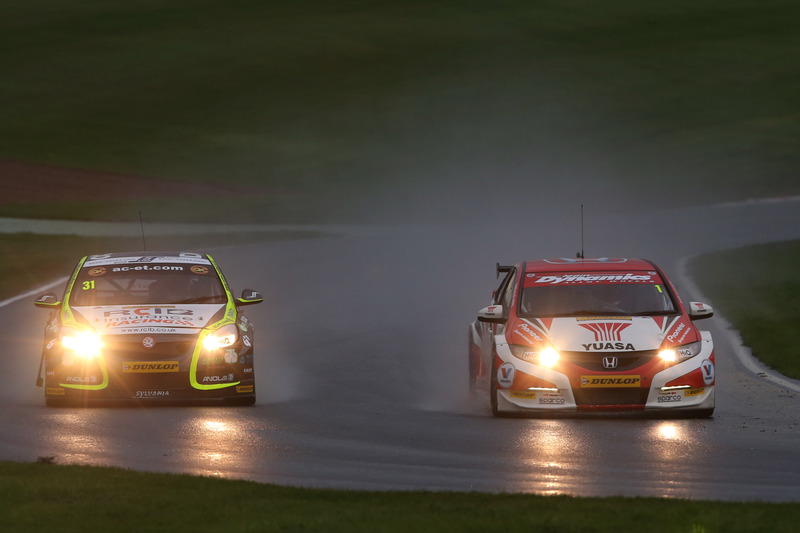 Vauxhall has now completely left the British Touring Car Championship. Heading in 2015, there may yet be no official plans or even rumours of a Vauxhall return, but with the NGTC regulations going from strength to strength, I would not rule out a return. A while ago I wrote an article about the Return of the Manufacturer to the BTCC, and I believe this now more than ever. If I was to put my money on an ex-manufacturer making a glorious return to the sport, I would take the bet with Vauxhall. In the 90s and even the 00s, the Vauxhall was quite clearly the perfect drive for both factory and independent teams; there were times when Vauxhalls would outnumber other manufacturers by at least 3:1 in many years. The audience has grown, the new regulations limit spending (eliminating the financial issues) and the sport is fast returning to world recognition as the best race series in the world. Even if not as a manufacturer, the potential to have an independent entry with an Insignia is considerable. Look what Jack Goff managed in 2013. Unlike Volvo who have announced that their motorsport division does not follow their company vision and will pull factory backing in the next few years; Vauxhall have become famous for producing what is essentially ‘race cars for the road’, whether this is the Astra, Corsa or of course the 600BHP monster that is the VXR8. What better way to market such a brand than enter the best series in the world as a factory-backed team. Cars In Literature: Where Are They All? Over 110 years ago (3 June 1914, to be exact), an American journalist named Stephenson Browne boldly wrote that “the motorcar, or the automobile, as one pleases, will probably take the place of the horse in fiction.” Looking back across the past century of fiction, was this prediction printed in the Boston Globe correct? Well, the answer is probably “no”. Fiction certainly does have some iconic cars – no doubt about that. It’s rather hard to imagine James Bond without his Aston Martin (although, if you want to get really picky, this is not the only make he drives in either the books or the movies). 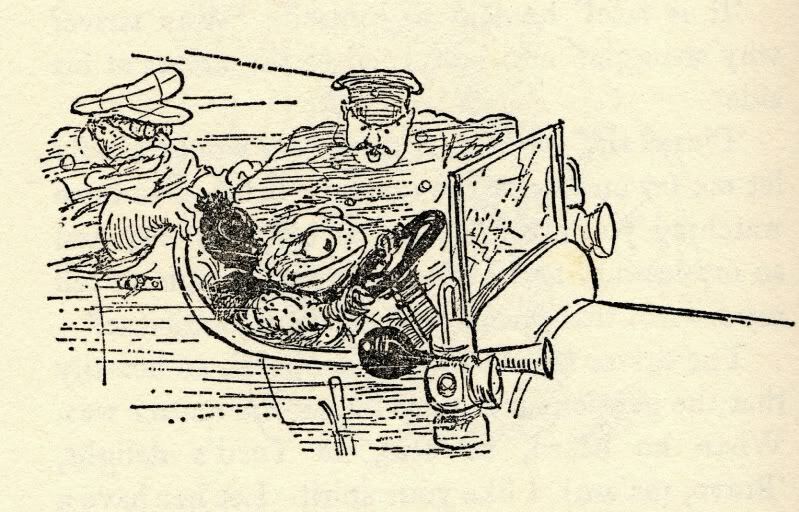 It’s also hard to imagine Mr Toad without his string of unnamed motor cars (all of which have horns that go poop-poop!). But is there really a literary equivalent of, say, the Black Stallion, My Friend Flicka, Thunderhead or Black Beauty, where the life story of the car is central to the plot rather than providing the protagonist with a means of transport? Only two or three cars seem to be literary protagonists: the completely imaginary Chitty Chitty Bang Bang and the nasty Plymouth Fury Christine of the Stephen King novel called, surprise, surprise, Christine. Very honourable mention also has to go to Val Biro’s Gumdrop, protagonist of a series of children’s picture books about a 1926 Austin 12 that sort of does for cars what Thomas the Tank engine does for steam trains. Usually, stories that include cars are usually more about the driver and the journey rather than the car itself. On the rare occasions where a car’s make and model is actually specified, this is usually the author’s way of letting you know something about the character who drives it. Not that makes and models make it in all that often. In The Great Gatsby by F. Scott Fitzgerald, a glamorous yellow Rolls-Royce (a symbol of the hedonistic Bright Society portrayed in the novel) is involved in a hit-and-run accident; as this car is easily recognised, it leads to the death of the title character. Dorothy Sayer’s aristocratic detective Lord Peter Wimsey is as passionate about his fast cars as he is his first editions and fine wines. Mrs Merdle (his Daimler Twin-Six) makes a number of cameos in the various novels, including a dramatic interruption to a late-night illegal road race (a small excerpt opens our review of the Jaguar XJ8 ). An enchanted Ford Anglia comes to the rescue of Harry Potter and Ron Weasley on several occasions in Harry Potter and the Chamber of Secrets – notably rescuing them from (spoiler alert) the gigantic spider Aragog. Fleur Beale’s Slide the Corner contains quite a lot of rally driving as a car-loving misfit finds out where he really belong. Inflicted on teenagers as class novel to study in New Zealand classrooms, alongside an unnamed banger in a Patricia Grace short story called It Used To Be Green Once. (really scraping the bottom of the barrel here): numerous vehicles are mentioned by make and model in the Twilight saga, notably the VW Rabbit restored by Jacob Black and the yellow Porsche 911 stolen by Alice Cullen. Apparently, the author’s brothers are motor enthusiasts; hence how these books get a bit more brand-specific than your average Mills & Boon. One of the lead characters in the Hitchhiker’s Guide to the Galaxy is named Ford Prefect. However, this character is a humanoid alien rather than a vehicle, more’s the pity. 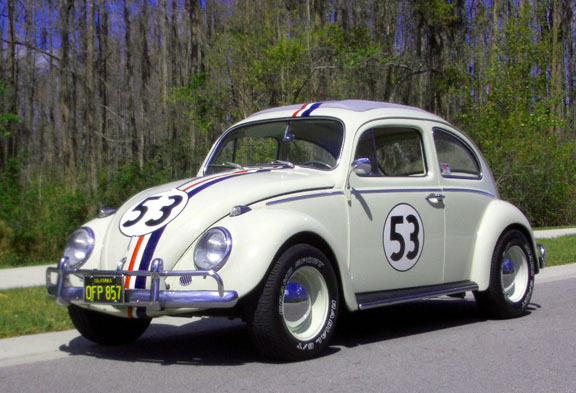 If you have any favourite fictional cars – from books, not movies, TV shows or films – let me know the good ones!